This statement consists of two pages, signed by me, is truthful and in accordance with my understanding. I am the person referred to above, resident at the address previously provided to the police. Today, officers from the Leicestershire police force questioned me about some of the aspects related to the Madeleine McCann inquiry. 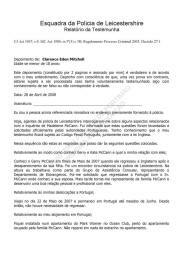 I was informed that these questions were raised and officially requested by the Portuguese authorities. 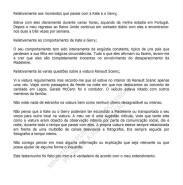 I am aware that my statement will be subject to the Portuguese Penal Code, as well as to Church law. These are the replies that I can make to the following questions. In relation to how I met Gerry and Kate McCann and what my relationship with them is: I met Gerry at the end of May 2007 when he returned to the UK after his daughter's disappearance. It was a circumstantial meeting at Leicestershire Police station. At the time I was working as part of the Consular Assistance Group, representing the foreigners department. 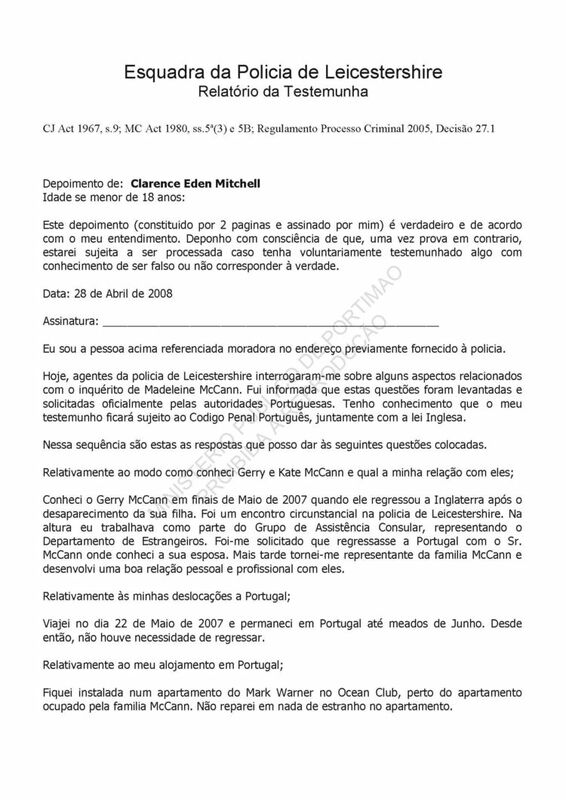 I as asked to return to Portugal with Mr McCann, where I met his wife. Later I became the McCann family's representative and I developed a good personal and professional relationship with them. As regards my travel to Portugal; I travelled on the 22nd May 2007 and remained in Portugal until the middle of June. Since then, there was no need to return. As regards my accommodation in Portugal, I stayed in a Mark Warner apartment in the Ocean Club, near to the apartment occupied by the McCann family. I did not notice anything strange in the apartment. With regard to the moments that I spent with Kate and Gerry; I was with them daily for various hours, whilst I was in Portugal. After my return to the UK I continued to be in daily contact with them and we would meet two or three times a week. With regard to Kate and Gerry's behaviour; Their behaviour has been entirely of constant anguish, typical of parents who have lost their daughter in tragic circumstances. Everything that they said or did leads me to believe that they are completely innocent of involvement in the disappearance of Madeleine. With regard to the various questions about the Renault Scenic: I often saw the car but I do not remember whether I was only inside the Renault Scenic once. I travelled as a front seat passenger on the night that we went to the charity concert in Lagos. Gerald McCann was the driver. The vehicle was packed with other family members. I did not notice anything strange about the vehicle nor any unpleasant or intense smell. I do not think that Kate or Gerry could have hidden Madeleine or transported her body anywhere in the car. In my opinion this is a ridiculous suggestion, given that they as well as the car were the object of intense observation by the media, day and night, during the whole time that I was with them. The car was always parked in front of a multitude from television channels and photographers. The car was always followed by photographers during the whole time. I cannot think of any more information or explanations that could be relevant or that could help the investigation in any way.